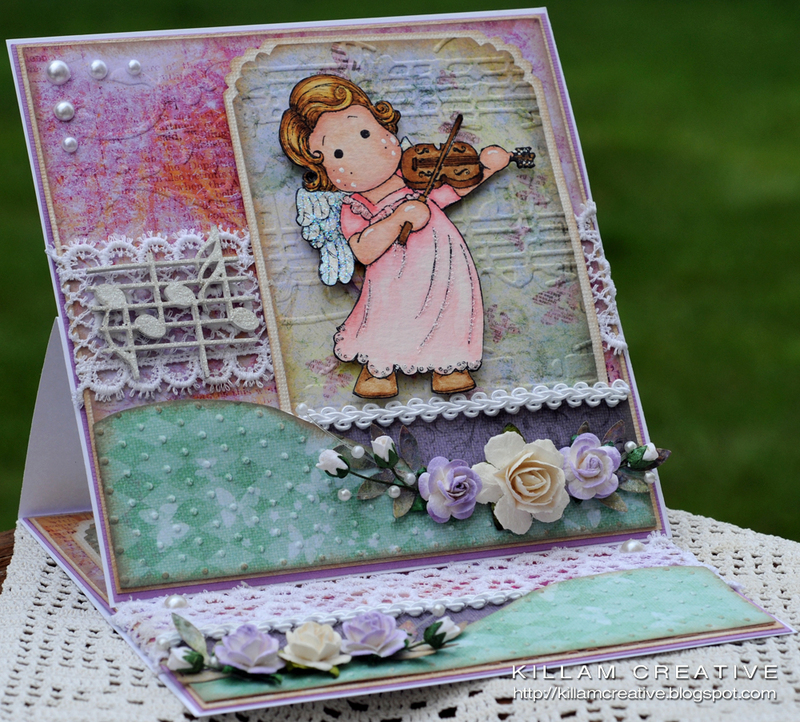 A very dear friend asked me to make cards for her soon-to-be 15 year old grand-daughters. 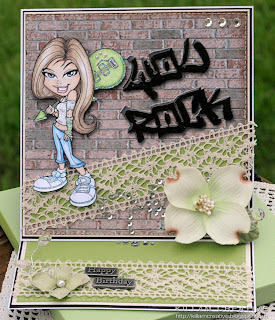 She was looking through older cards and loved this one, so I decided to customize it for the girls. Well, you know how styles and tastes change over time, right? 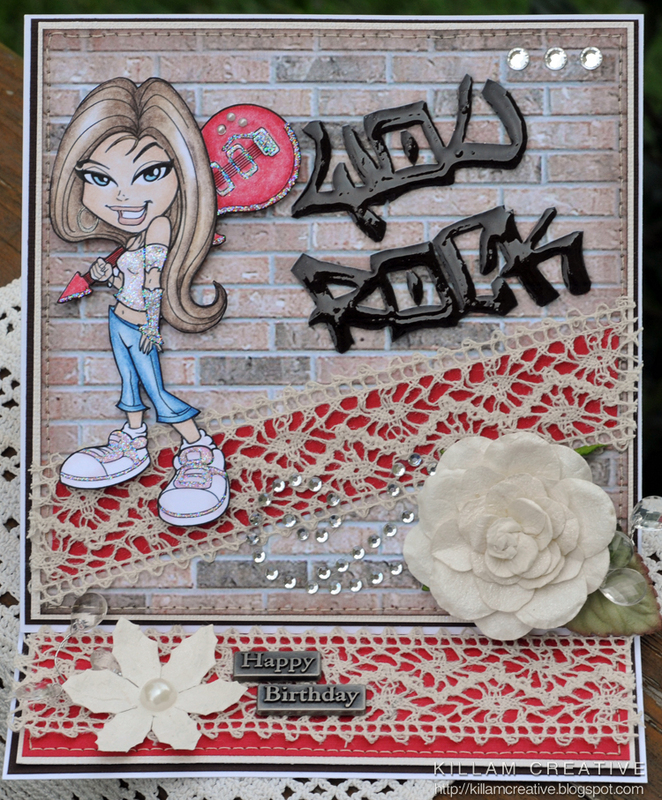 Even though it was a short 5 months ago, I couldn't image making that card again... so I kicked it up a notch! 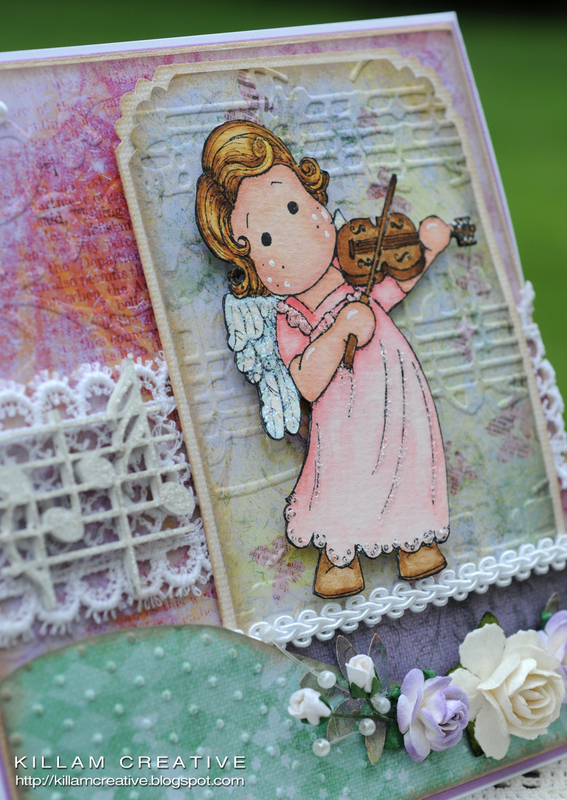 I'll show you Alyssa's card first - they are both easel style, with a little surprise inside. The incredible image is from Kenny K - can you believe this Rock Chick's coolness? 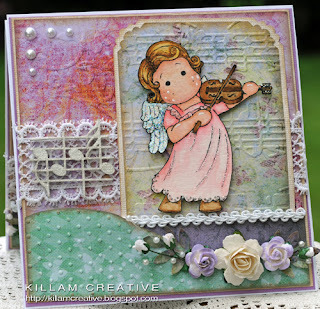 Kenny has a bunch of great digital stamps with new releases this weekend... ack! I can't wait! Now, back to Alyssa... *grin* Here's the full easel view - the easel can rest on the line o' rhinestones as shown, or right above the lace (I kinda like the second option better). 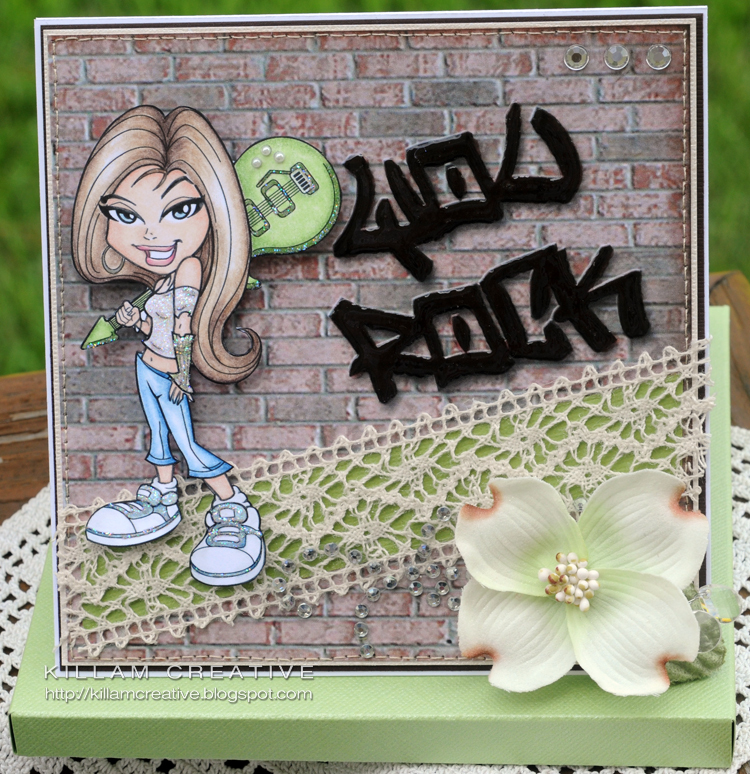 Rock Chick Alyssa is cut out and popped up on 1/8" dots. Here is the "surprise"! 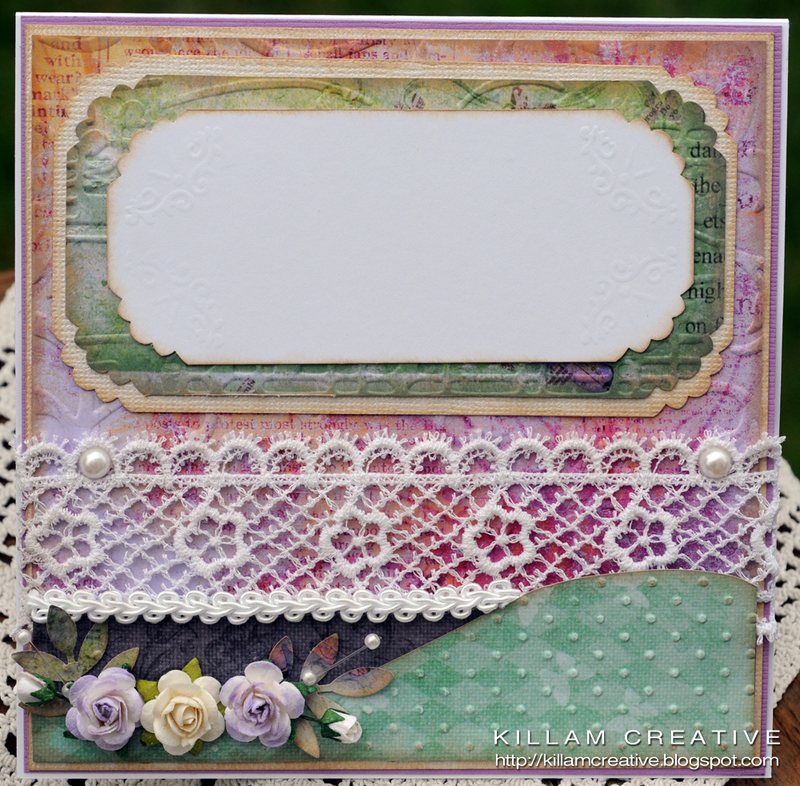 I don't usually embellish easel folds, but it just cried out for personalization on these cards. Let me tell ya, Photoshop was definitely my friend on these projects. 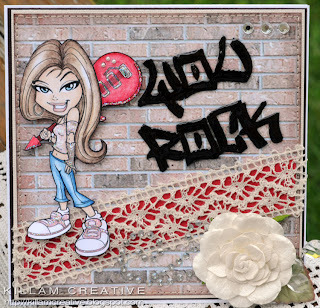 I used the same graffiti font on the brick wall and added a stack of books for reader Alyssa. Did I mention that the brick wall is actually digital paper? Yep! I sized it in PS, added the name with a white drop shadow and arched it slightly. I decreased the opacity of the books to make them look like worn graffiti. After all that was done, printed and heat set, I filled in all the letters (on the front panel and envelope, too) with Glossy Accents for a great shine and dimension. Here is the envelope - also Glossy Accent'd. You can really see the shine on "You Rock" in this photo. 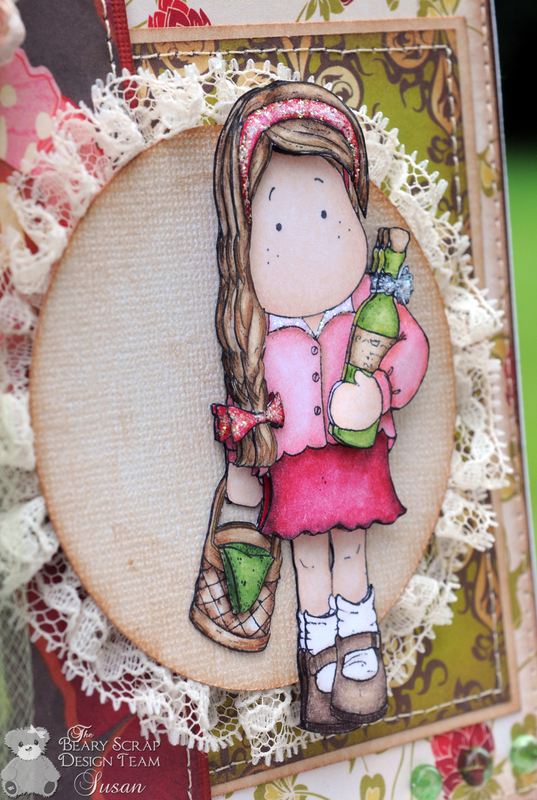 Now let's take a peek at Brenna's fabulous card! Here's a view of the easel in front of the lace - it flows much better, I think. 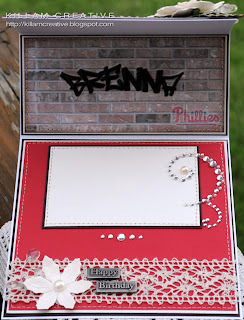 Brenna is a huge Philadelphia Phillies fan so I found a fun logo to graffiti on the wall. So, that's it for these lovelies! Girls, if you happen to find your way here, Happy Birthday! I hope with all my heart that you love your cards as much as I do. I had a blast creating them! 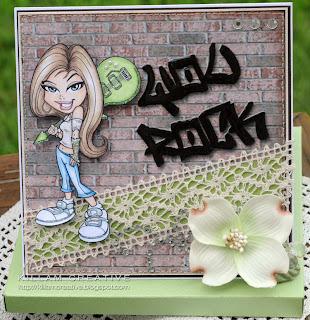 Stamp - Kenny K "Rock Chick"
Hello hello! It's the end of July and -for many of us- the hottest time of the year. While out and about today the car thermostat read 102°! [I am most definitely jealous of all our readers in the Southern Hemisphere right now!] Sooo, what better time than to think Christmas (and cold weather for me)? This week The Beary Scrap Design Team will celebrate Christmas in July *and* sponsor a Christmas-themed challenge over at ABC Christmas Challenges (starting Wednesday 7/28). Come join us! 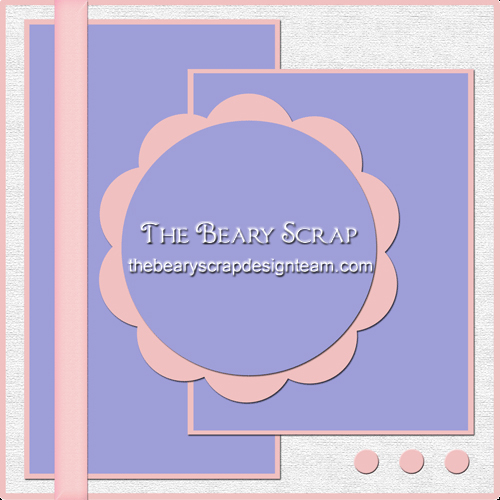 This just in: The Beary Scrap is extending the Christmas in July 25% Everything sale through Tuesday! Use discount code JULY25 at checkout to get the sale price on everything you buy - even clearance stuff! Oh, *and* you'll receive a 15% off coupon/code for your next purchase before September 30th. Click HERE now! 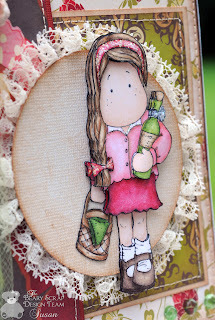 I had fun with this card! I LOVE the "Snowed In" line from My Mind's Eye and couldn't wait for this challenge. Here's a bonus for you: It's on sale right now! 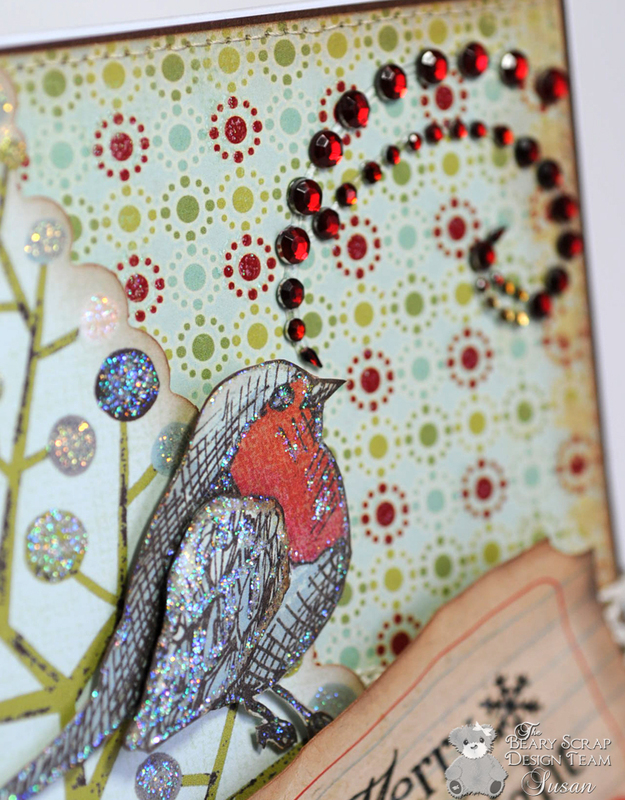 I cut out the bird on the "Merry Christmas" paper and outlined his body and random feathers with Stickles Star Dust. I used a second bird for a popped-up wing - I have to have my 3D! 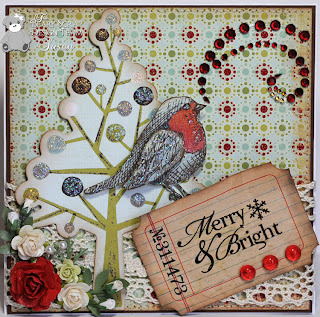 The tree is from the Snowed In Accessory Sheet, which includes loads of other great die-cuts, too. 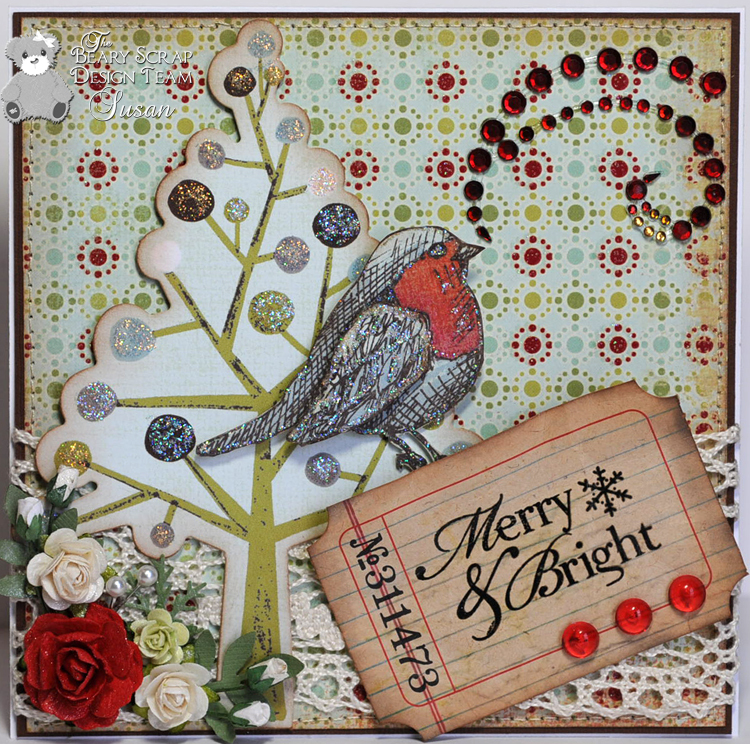 I colored the ornaments with Stickles Star Dust and Diamond. You know Star Dust is my favorite Stickles, and Diamond runs a close second with it's gold tint. 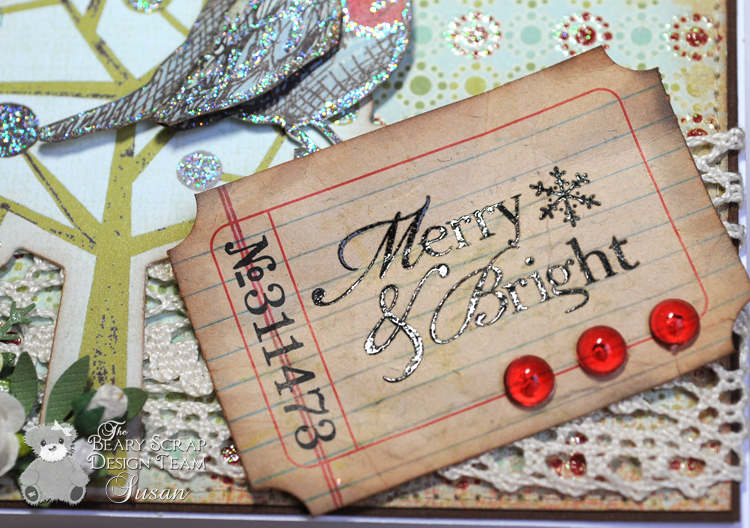 I stamped Merry & Bright with black pigment ink and embossed with clear embossing powder. I love the effect next to the Dew Drops! 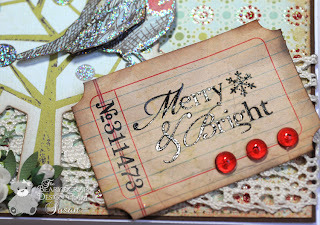 I crumpled up the tag before stamping, and inked the edges after embossing. In this photo you can also see my Stickles randomness on the birdie. Thanks so much for visiting today. I don't know about you, but I can't wait to see what the rest of the team comes up with for this theme - love it! 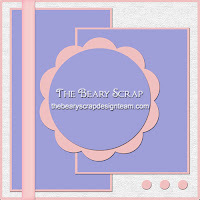 If you're in the Christmas mode, too, you can participate in the challenge at ABC Christmas Challenge (starts Wednesday, July 28) and possibly win a $20 gift voucher from The Beary Scrap! Whoo hoo! 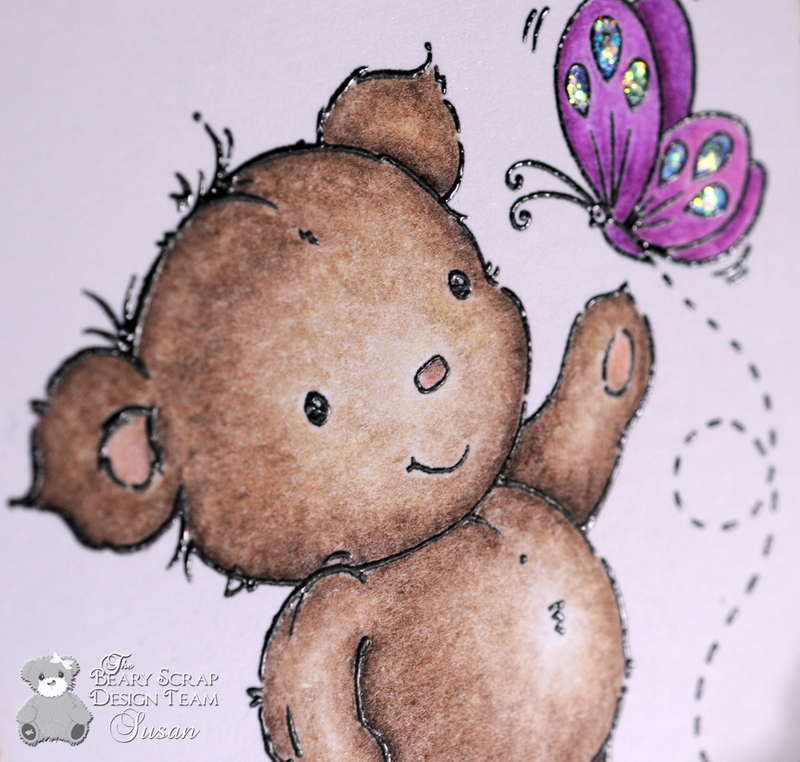 And definitely don't forget our sketch for the Beary Sweet Challenge #6 going on right now - click HERE for all the details! I have to admit I was shakin' in my shoes at this combination... until I took a closer look at Basic Grey's Capella line. It's perfect! 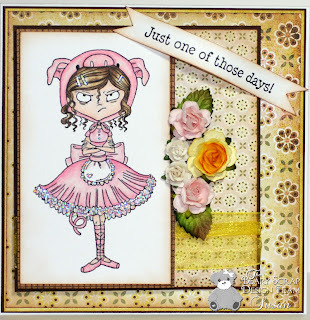 I paired it with the absolute perfect stamp for this challege - Kraftin' Kimmie's Angry Ballerina. She's in a pig costume - could it get any better? Thanks for stopping in today - have a great week! Hello dear friends! 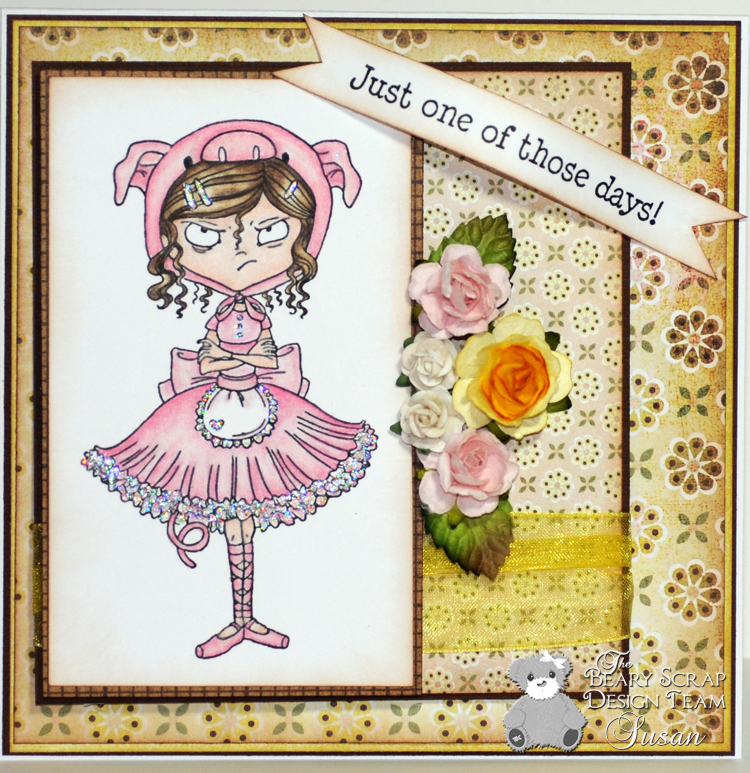 It's sketch week with the Beary Scrappy Girls -- ooh, I love sketches. This week we get to work with a sketch made by our very own Kimm. Thanks for a fun one sweetie! This card is dedicated to my sister-in-law, who is leaving Saturday for a vacation in California's wine country and San Francisco... with her husband, his brother and their mother. Best of luck to ya, Sis! 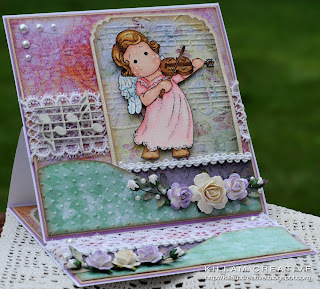 Magnolia Stamp Lovers #14 (7/17) - Have a nice trip! Hello hello hello! Thanks so much for visiting me today. Over at The Beary Scrap Design Team blog we're serving up our samples for Beary Sweet Challenge #5 - Emboss It! For my project I've chosen the absolutely adorable Penny Johnson bear from Stampavie. This little guy has the sweetest little bear face! 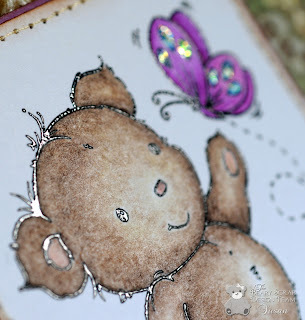 I used embossing powder on the bear - I've always wanted to try this technique. I used Versafine black pigment ink because I like the fine-ness of it and pigment inks dry slower than dye. 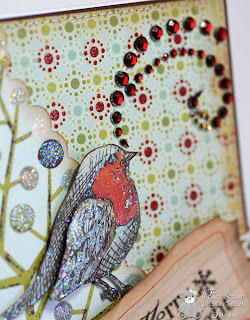 This gives enough time to add the embossing powder. 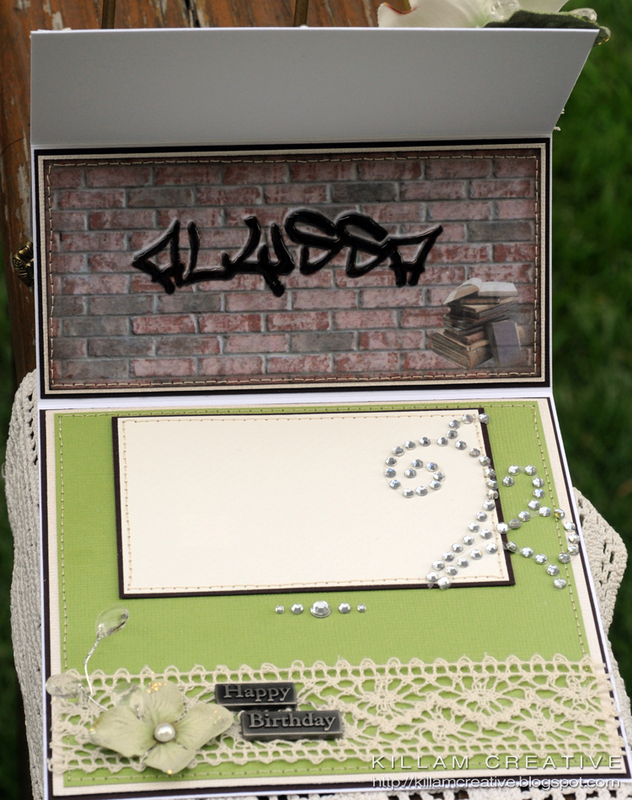 Plus, I only have clear embossing powder and needed the black outline. *grin* Anyway... I think he turned out really well, and it adds another layer of dimension to this card. As luck would have it, this stamp is sold out right now, but check out his brother bear hanging out with the birds. How can you resist that face? ... Or even the adorable Popcorn the Bear stamps here. Lovin' the bears! 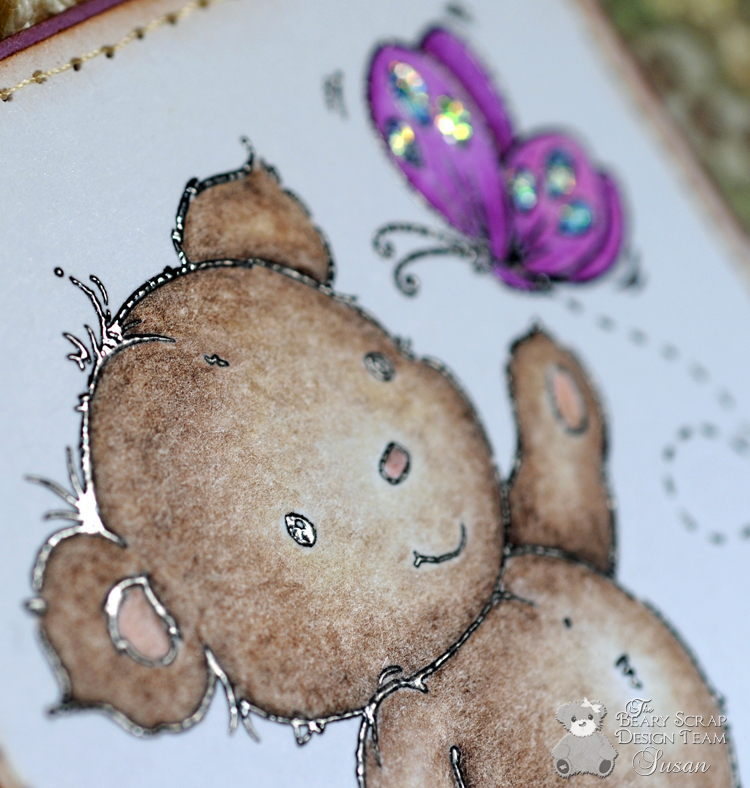 Beary Sweet Challenge #5 (7/14): Emboss It! Medium - Stampendous Detail Embossing Power in clear; Stickles Star Dust on the butterfly; Glimmer Mist Pearl on the branch; Colorbox Fluid Chalk in Chestnut Roan; Prismacolor pencils with OMS. Embellishments - Mulberry roses; Pearls; crochet lace and ribbon bits from the bottom of my closet... really! So that's it for me. 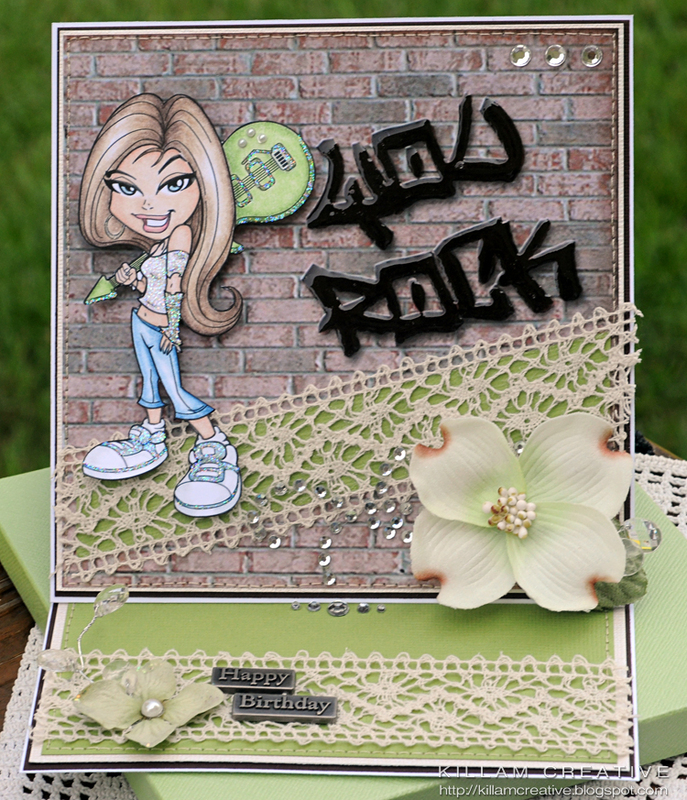 Please visit us all week for embossing samples from our wonderful design team. I hope you can find inspiration with us and enter our challenge by the end of the day on July 14th. CLP #27: July Sketch Challenge! 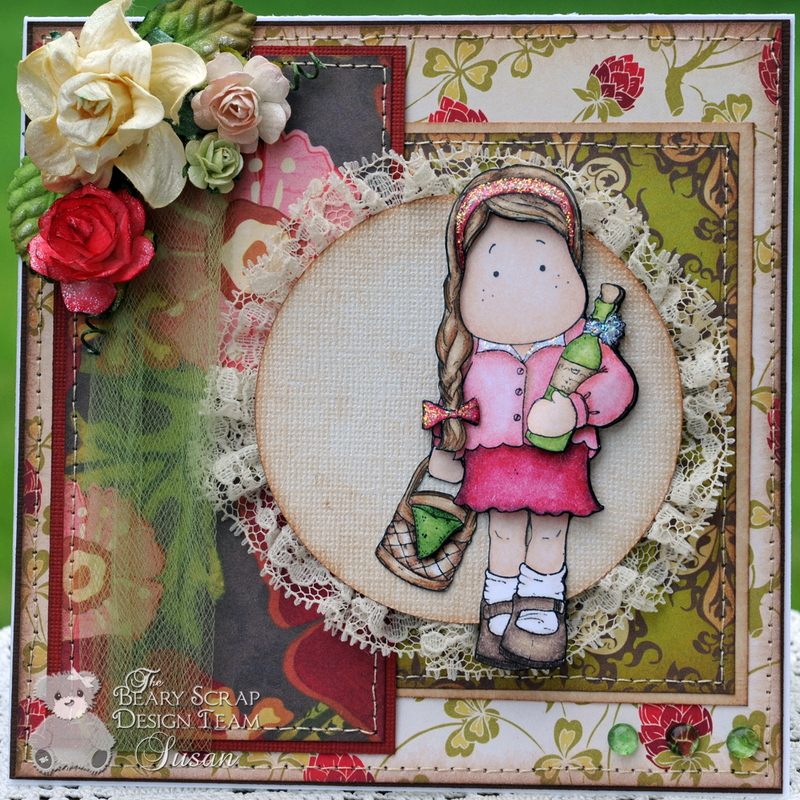 This month the CLP Sketch Challenge #27 is sponsored by Sassy Studio Designs - check out all the sassiness here. 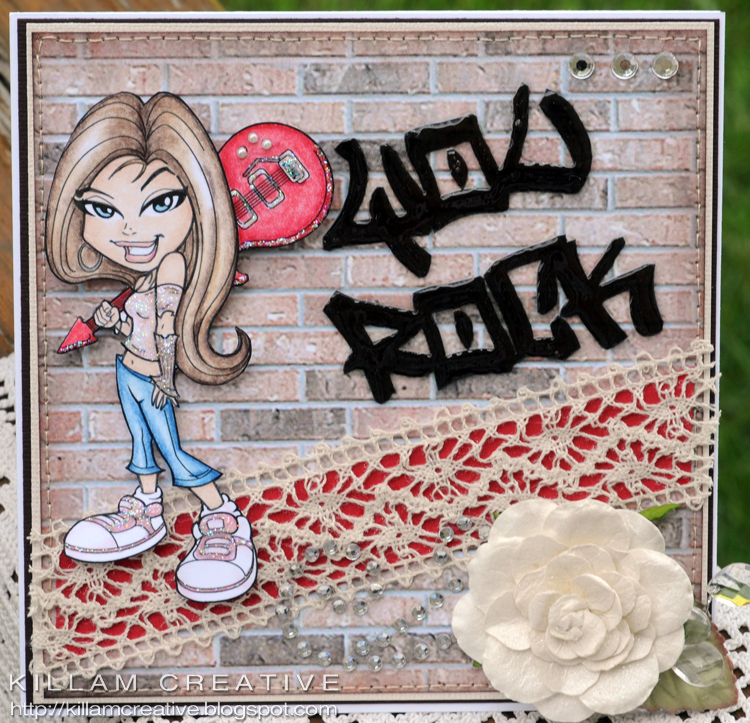 This month's winner will have their choice of 4 Sassy Studio digital stamps! Anyway, when I saw this sketch I *knew* I could ride that wave, so to speak. I stayed pretty true to it, with the exception of the detail in the top left corner. That's always been my pleasure with sketches - staying close to the original design. Sometimes it's a challenge, and sometimes it just falls right into place. This card definitely fell into place easily! I used Prima papers won as part of a CLP challenge in January... yes, I've been hoarding them! It's sort of poetic that they end up on a CLP DT card many months later, no? 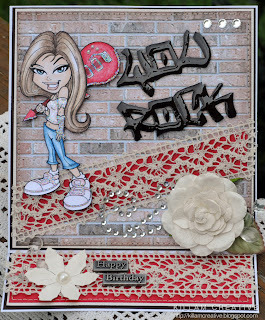 I definitely have embossing on the brain, and it spilled out onto this card. 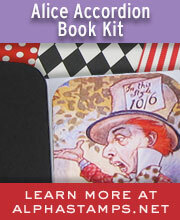 Three of the four visible layers were embossed on the Wizard with Cuttlebug folders. I can't believe I don't reach for these more often - I just love the textures! I've set aside my Prismacolor pencils and experimented with distress inks once again. I'm really happy with this effort and will definitely continue as I build up my collection. 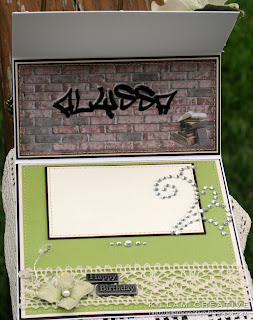 I'm turning into a Tim Holtz junkie and now have a spreadsheet I can access on my phone with all the colors and types. This way I'll always know which pad/refill/stickles/crackle I have and can buy on the fly without repeats... It's a sickness, I tell ya! Here's the full inside - I love the easel style card by don't really love the signature panel, so I tucked it behind the easel this time. Now that I've loaded you up on photos, I'll bid adieu and wish each and every one of you a happy weekend. Here in the States it's Independence Day on the 4th. We're spending a long weekend with the in-laws in another state and will be on a boat in a lake watching fireworks. I'm excited! Safe travels to you all! 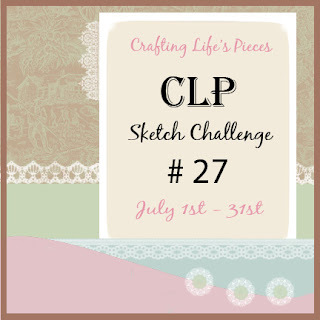 The CLP July Sketch Challenge runs from July 1 - July 31, and you can get all the wonderful details and enter your project here! Good luck, and can't wait to see your beauties!